The 2018 midterm elections are well underway, and you know what that means: another opportunity for local election commissions to display widespread incompetence and/or ratfuckery. Just like every year I can recall, a slew of polling stations are reporting technical issues ranging from scanners breaking down to electronic machines seemingly changing people’s votes. 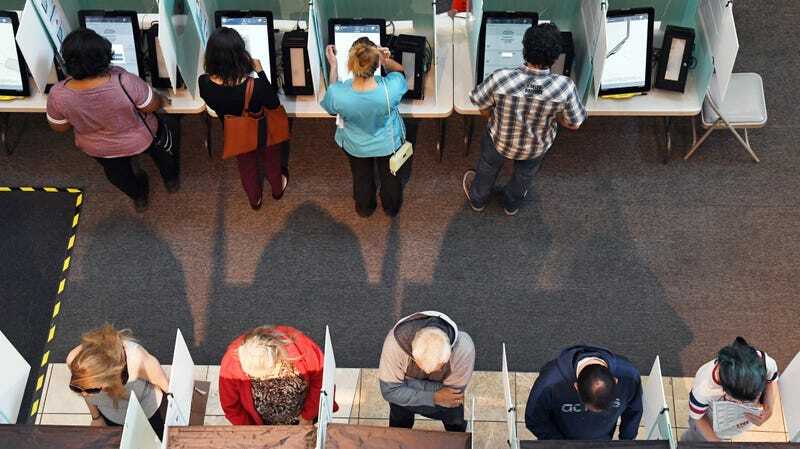 (This is to say nothing of the widespread efforts to inconvenience, disenfranchise, or otherwise unnecessarily complicate the voting processes, it’s own rich topic for another blog.) After all, many of these machines are around 15 years old and local election staffers have documented calibration issues with them in previous races. Why should this election be any different? Below is a running tally of the rich tapestry of malfunctions being reported at polling stations across the country. If you experience issues voting, call the U.S. Department of Justice at (800) 253-3931 or the Election Protection Coalition at (866) OUR-VOTE. You can also tip us with a detailed message, and we’ll be glad to update this post. That humidity problem in Alabama? Same issue in multiple precincts of NC, where ballots are being stored in “emergency bins” until they can be read. We’ll be updating this list as Election Day 2018 wears on. Experience problems while voting? Shoot us an email at tipbox@gizmodo.com.